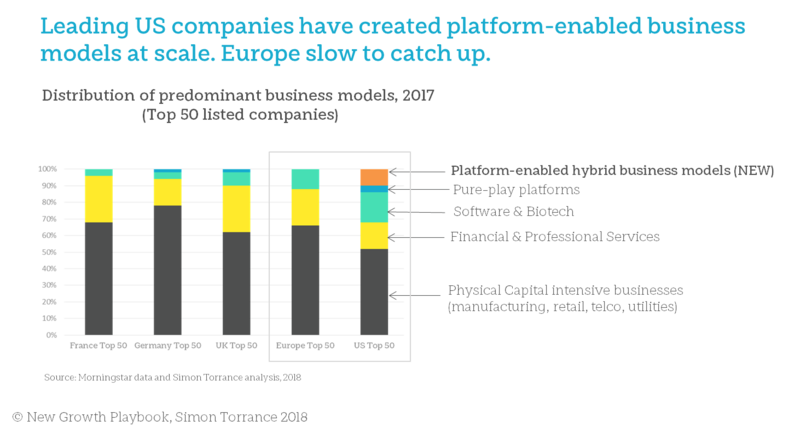 In 2016 European firms accounted for just 4% of the global market value of platform businesses (companies like Apple, Amazon, Alibaba, Uber and Tencent). China had a 24% market share and the US 70%. This is important because companies with platform-enabled multi-sided business models significantly outperform those with predominantly one-sided product or service centric models (companies like BMW, HSBC and Axa) in terms of growth rates, return on assets, margins and valuation multiples. ‘Platform-enabled, multi-sided’ means that a significant proportion (15% plus) of the company’s overall business model – the way it creates value for customers and captures value for itself and where it invests its capital and management attention - relies on it acting as an intermediary between multiple parties of consumers and producers. These businesses are asset light (or asset lighter) and they succeed through generating ‘network effects’. This means that their ‘product’ gets more valuable the more people who use it. For example, the more developers who create apps for the iPhone, the more valuable the iPhone is to consumers, which attracts more developers to invest time creating apps. Seven of the ten most valuable companies in the world today operate this type of business model. But none of these global leaders originated in Europe. Venture capitalists and entrepreneurs spotted the economic power of this model. 60% of the $1 billion plus ‘Unicorn’ start-ups – companies like Airbnb, Didi, Lufax – operate it. Ant Financial is now worth more than Goldman Sachs. There are European unicorns, but they are not the biggest. Europe’s relative position has got even worse. As the network effects of the hyperscale platform businesses get stronger and the growth potential of the old-world business models - which dominate its banks, oil companies and industrial conglomerates - get weaker. The US and China have significantly increased their positions in the list of Global Top 100 companies over the last few years (see Fig 1 above). But the market value of the European companies’ in the list has fallen by a quarter, while their total number has decreased by a third. If you compare the business models that ‘national champions’ are operating you can see the problem (Fig 2). Europe today just doesn’t have any major companies in its Top 50 that operates the types of business models that leverage the digital economy best. SAP comes closest, but its business model is still in an early phase of transformation. Of course the ‘digital masters’ who successfully operate platform-based business models form a very small club: less than 2% of listed companies in the US and elsewhere. 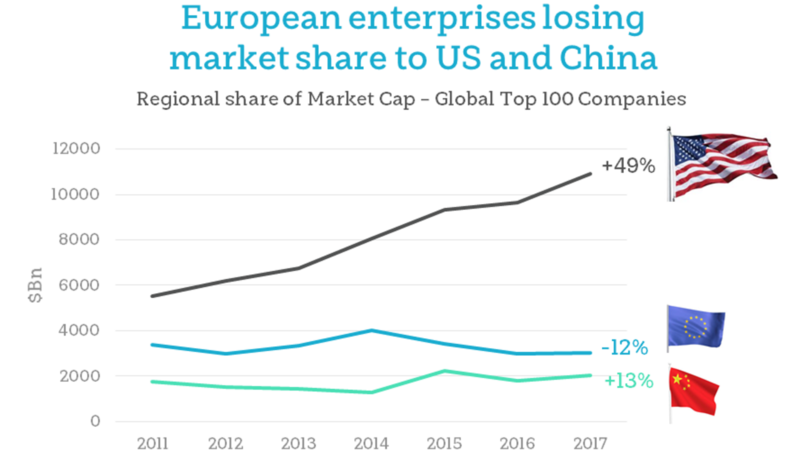 The vast majority of US and Chinese firms still operate the same traditional, slow-growth business models as the Europeans. US manufacturers, banks and telcos for example are no more innovative than their European counterparts. US and Chinese companies have clearly benefited from large and relatively homogeneous home markets in which to establish themselves, plus dynamic local VC and investment ecosystems. But what’s really set them apart – from incumbents at home and abroad – is their adoption or incorporation of platform-based business models. Apple ran a traditional product-centric business model until it launched the appstore for the iPhone. Amazon was a linear online retailer before it created its open marketplace. Facebook took off when it opened up to developers. Tencent’s value increased as it aggregated more and more on its platform. Microsoft has retained a dominant position by nurturing multiple third party ecosystems (Xbox, LinkedIn, Skype). But Europe, with a similar GDP and much bigger population than the US, is falling behind. The problem is one of knowledge and understanding, at senior industry and government level. The European Commission – the executive arm of the European Union – decided to do something about this with its ‘Digital Single Market’ strategy announced in 2015 (pre-Brexit). The aim was to create laws and structures to ensure ‘Europe's economy, industry and employment takes full advantage of what digitalisation offers’. As part of the strategy the Commission looked in detail at digital platforms (what they called ‘Online Platforms’). The analysis was good and thorough. Since then the Commission has announced it would invest €1 billion between 2018-20 investment to support ‘strategic next generation platform building’ in industrial sectors, large-scale piloting, and ‘related activities’. The focus is on smart factories, platforms supporting agricultural and rural economies, smart hospitals and healthy living, smart homes, big data solutions for energy and smart construction. It announced that “digital industrial platforms are key to place Europe in the lead of digital transformation”. Brexit of course complicates things. But the principle still applies to all old world countries. There has certainly been a pick-up in activity in Europe amongst incumbents, particularly in Germany. Siemens Mindsphere IOT platform is more advanced and maturing faster that GE’s Predix. ProSiebenSat is the first TV company that has invested heavily in e-commerce marketplaces to complement its content activity. Its revenues and profits are ahead of its peers. Zalando – an online retailer specialising in fashion – has enjoyed a 48% CAGR over the last five years, defending itself well against Amazon. Daimler and BMW have been more innovative than their US counterparts in creating mobility service platforms. They even took the bold move last month to create a joint venture merging their respective activities into one in an attempt to create scale. Even Deutsche Bank, with its traditional business model under very significant pressure, is making bold moves into two-sided ‘beyond banking’ marketplaces. In France and the UK the activity is less pervasive among its old world national champions, but both countries have given birth to some strong unicorns (Blablacar is doing well and Just Eat – an intermediary between hungry people and restaurants - became worth more than Sainsburys). But is still a very long way to go for incumbents, not just in Europe but around the world, if they want to compete effectively in an increasingly digital economy. The World Economic Forum talks of a ‘Fourth Industrial Revolution’ – a merging of the physical, digital and biological worlds. Revolutions tend not to be good for incumbent princes. The chart below (Fig 3) below provides a snapshot. Most companies have a predominant business model which leverages a certain type of capital or class of asset. Manufacturers, retailers, telcos exploit physical assets; banks a mix of financial and human; consultants sell human expertise; software, biotech or digital content creators focus more on intangible assets encapsulated in ‘intellectual capital’. But platform-based business models exploit – at scale – what we can call ‘relational capital’: they facilitate high value interactions, transactions and relationships between multiple actors. Companies have always done this to some degree – building long term relationships with customers and suppliers. Figure 3 also shows the portfolios of incumbents in three major incumbent industries (in the US and Europe, they are about the same) – financial services, automotive, telco. The colours in the pies relate to the type of capital that is being exploited, and to what proportion. While there is some trace of green (intellectual capital, typically manifested in digital services) and blue (relational capital best exploited via multi-sided platforms), the proportion is significantly less than the digital masters, who have incorporated much more. To show a way forward, there are some pioneers who have broken the mould. Softbank, originally a Japanese ‘telco’, has invested heavily in platform businesses, its own and third parties’ as part of a bold synergistic online/offline strategy. Ping An, originally a Chinese insurance company, now describes itself as a ‘technology company with financial services licenses’. It operates platform-based ecosystems in real estate, automotive trading, healthcare as well as finance. It is now worth more than Allianz, Axa and most recently HSBC. There are an increasing number of good examples that show a way forward for cautious incumbents. But for national champions, industrial strategists and policy makers in post-Brexit Europe there are some key imperatives. European leaders – Chairmen and CxOs at leading corporations have very little understanding of digital business models and the economics of digital platforms. It wasn’t taught when they were at business school. A very significant re-education of Europe’s business leaders is needed. As more and more physical products become connected to the internet and boundaries blur between different sectors, many more opportunities arise to create new ecosystems of innovation. New approaches to analysing the opportunities are needed. Capital allocation is the best way of translating strategy into action. Yet the vast majority of incumbents (all over the world, not just Europe) get trapped into planning the same budgets every year. 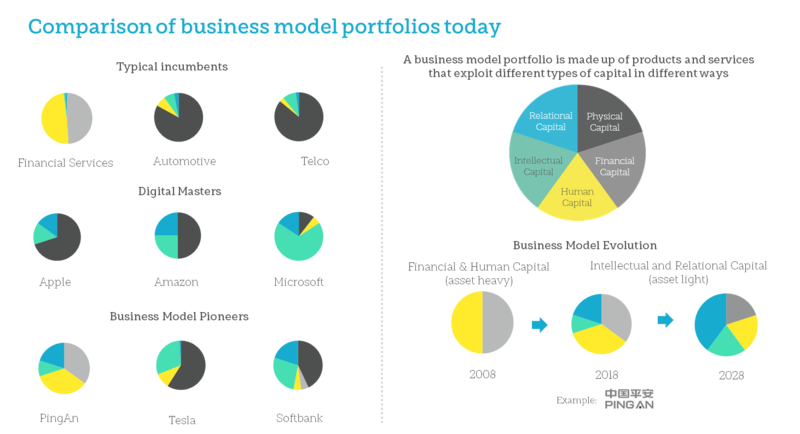 There is an urgent need to create a business model centric investment portfolio approach. ‘Protect the core’ is important, but it’s also critical to create an ‘invent the future’ business unit with its own space, oxygen, power and prestige. Platform-based business models put organisations in the centre of ecosystems of innovation comprising multiple parties contributing different types of value. All organisations must learn the new skills of incentivising third parties (including developers) to engage with them in a way that's scalable. Ultimately it's about leveraging and monetising intangible and tangible assets (people, ideas, physical things, data, creativity, trust, money) that you don't have to own or even control. A new skill for all incumbent organisations. Europe was the birthplace of the modern world. It now needs a business model renaissance to be fit for the future.